This salad really blends the offerings of both spring and summer. A few months back, my organization, Turnaround for Children, hosted its annual Turnaround Impact Awards Dinner at the Cipriani 42nd Street. I’ve worked on and off in nonprofit for nearly a decade now, yet surprisingly, this was my first real gala. I’ve worked and attended breakfasts, wine tastings, cocktail hours and dinners, but nothing as extravagant as this event. The evening was wonderful and the food, quite a highlight. Perfectly cooked Bronzino fillet, served upon a creamy bed of spring pea risotto sat center stage as our main course, but the real star in my eyes was the perfectly tender salad of asparagus, fava beans and chopped Portobello, topped with a sharp blade of Parmesan cheese. Instantly I knew this salad was something I wanted to attempt to replicate. 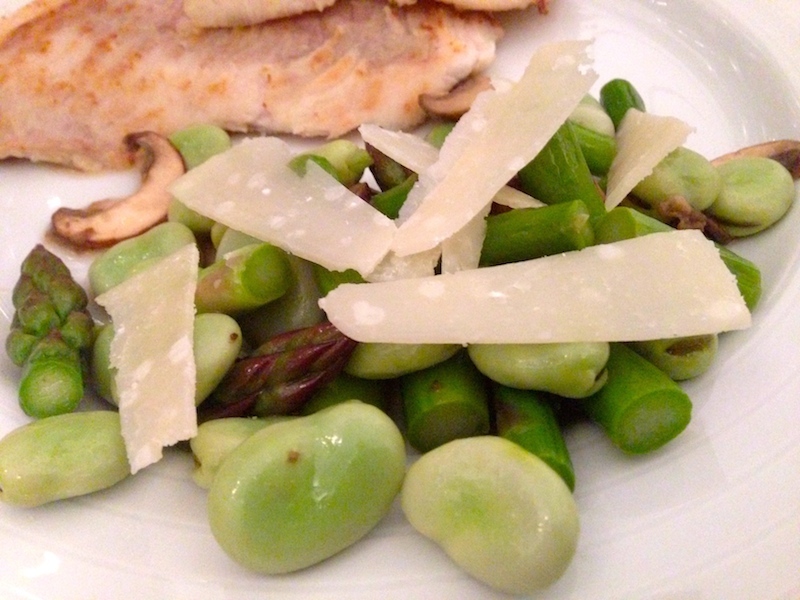 The gala was back in April and uber local asparagus hadn’t quite hit the markets, while fava beans were weeks away. It is like the delicate dance that we sometimes play with strawberries and rhubarb. While a perfect pairing, few know that they don’t actually grown at the same time. Rhubarb and bit earlier in the Spring and strawberries in the early weeks of June. Unless the growing season is off in one direction or another, there’s just a brief overlap where both can be celebrated together, only a few weeks of the year. Asparagus and fava beans create an even wider gap. One peaking in May and the other later in the summer as the weather becomes impossibly warm. It becomes a waiting game, gambling on the last bunches of asparagus and hoping the fava beans arrive in time. This year I lucked out. While I make no attempts to compete with the exquisite culinary skills of the Cipriani 42nd Street, I was satisfied with my results. A warm salad, barely cooked so the snap of the vegetables still shine through, with a simple dressing of acid and shaved cheese. Bring a medium pot of salted water to a boil. Blanch fava beans and asparagus until bright green, about 5 minutes. Remove vegetables from pot and plunge into ice water to stop the cooking. In a large skillet, heat olive oil. Add mushrooms and saute until tender, about 1-2 minutes. Stir in vinegar and a pinch of salt. Remove from heat. 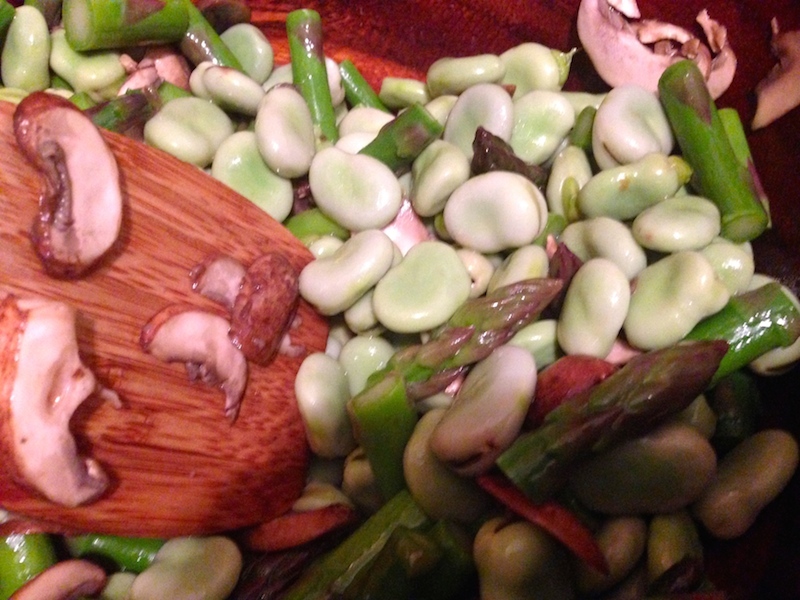 Toss mushroom mixture with fava beans and asparagus. Divide among 4 plates. Shave parmesan over salad and serve immediately. I love warm salads, this is a beauty, Love the fava’s and asparagus with the mushrooms and cheese, earthy, seasonal, rich and delicious. Great choice! Thanks Suzanne! It still doesn’t compare to the Cipriani, but I’ll take it!